In October 2016, they were on stage together for Masquerade in the US that was staged in Manila in February the following year. 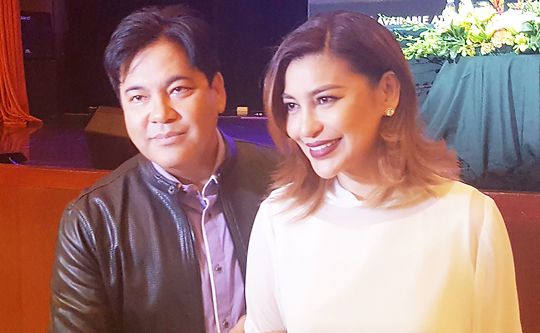 Now, the tandem—Martin Nievera and Lani Misalucha—is back for a Valentine concert on Valentine’s Day (Feb. 14), 8:00 p.m. at the Philippine International Convention Center (PICC) Plenary Hall. Nievera has been known up until these days as the Concert King (in the Philippines), while Misalucha as Asia’s Nightingale, and not one among the new breed of singers has been able to topple them from the titles bestowed upon them by concert producers and the local entertainment press. The two delight in the fact that this year Masquerade was nominated as Concert of The Year at the 9th PMPC Star Awards for Music, and both of them as Male and Female Concert Performers of the Year. Misalucha won the coveted trophy for her performance in Masquerade. Despite that experience, Martin said all their shows together had always been fun and memorable. Undeniably, the two are among the most remarkable and respected OPM artists of this generation whose songs, talent, and style will remain timeless and have gone classic through the years. co-presented by PLDT and Belo Medical Group and sponsored by: Farlin Baby Products, Zim Cleanser, Luxent Hotel, GAOC, Sacred Heart Diagnostic Medical Center Inc., Family Care Diagnostic Medical Center Inc., Athena Clothing and Trading Corp., Mcdonald’s, Doon Thai & Asian Fusion Cuisine, Tony’s Restaurant, and Amber Restaurant. Tickets are nearly sold out. Call Ticketworld at 891-9999 or visit www.ticketworld.com.ph or Starmedia at www.starmediaentertainment.com. As the world prepared to celebrate year 4,716 of the Chinese lunar calendar on February 5 as first day of the Chinese New Year, Anvil Business Club’s young Filipino Chinese entrepreneurs and invited special guest Christopher Lawrence “Bong” Go on Feb. 1. Friday morning, to share 10,000 free tikoy for urban poor communities in Caloocan City—5,000 tikoy to Camarin area and 5,000 tikoy to Barracks area, both in the north part of Caloocan City. Alongside Bong Go at this socio-civic project were Anvil Business Club officers led by Chairman Wilson Lee Flores, President Patrick Cua, Honorary Chairman Reynold Siy, Honorary Chairman Marcelo Co and tikoy-sharing Project Director Joeben Tai. Chinese New Year became an official non-working holiday in the Philippines in 2012. Also invited as special guests at the Anvil tikoy-sharing were Caloocan Mayor Oscar “Oca” Malapitan, Presidential Commission on Urban Poor Chairman Alvin Lanz Almeda, and Carmelo Africa and others. Anvil’s socio-civic project of sharing 10,000 free tikoy is the young Filipino Chinese entrepreneurs’ way of wishing the whole Philippines a happy and prosperous New Year. February 5 also starts new “Year of the Pig”, one of the 12 animal signs of the ancient Chinese zodiac. Anvil Business Club has many economic and socio-civic projects, like free college scholarships, disaster relief donations and the annual Sept. 28 Teachers Day honoring all Philippine teachers on the birthday of great teacher Confucius. “Tikoy” is the Filipino name for the Chinese New Year glutinous rice cake dessert called “ti-ke” in Hokkien (South Fujian) dialect of the ethnic Chinese minority of the Philippines and literally meaning “sweet pastry”. The tikoy is called “nian-gao” in Mandarin Chinese or meaning “sticky cake”. Tikoy may be eaten as is, but it is also more popularly cooked by dipping in beaten egg and lightly pan fried until crispy but still chewy inside. The Hokkien greeting for Chinese New Year is “Kiong-hee Huat-chai” and the Mandarin greeting is “Gong-xi Fa-chai”, meaning “Wish you a Prosperous & Happy New Year”!